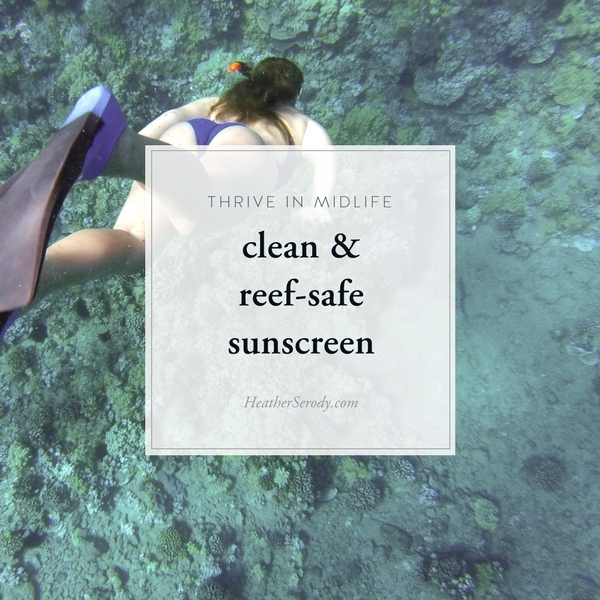 As part of my commitment to incorporating clean beauty products into my life this year it is time to take a close look at what to look for in a clean & reef safe sunscreen. You don't have to be a scientist to intuitively know that because sunscreen is applied to the skin and reapplied often that the ingredients in sunscreen should not be irritating or harmful to the body since anything applied to the skin has the potential to be absorbed into the bloodstream—especially because sunscreens often contain nasty “penetration enhancer” chemical ingredients which help them stay on your skin even after going in the water. Sunscreens can also be easily inhaled in the case of aerosol sunscreens or ingested in the case of sunscreen applied to the lips. I think we have all gotten a mouthful of horrible chemical-tasting sunscreen and just knew that that couldn't be good for us, but wondered what the alternative is – a face full of pure white zinc oxide? Do we have to choose between inconvenient sunscreen or ones that work but that come with a toxic load? Sunscreen works by either using a natural mineral blocking ingredients or chemical UV filtering ingredients. The other way sunscreens work is by using a combination of six chemical ingredients. Adolescent boys with higher oxybenzone measurements had significantly lower total testosterone levels (Scinicariello 2016). Men with greater exposures to benzophenone-2 and/or 4-hydroxyoxybenzone had poorer sperm quality (Louis 2015). Animal studies report lower sperm counts and sperm abnormalities after exposure to oxybenzone and octinoxate, delayed puberty after exposure to octinoxate and altered estrous cycling for female mice exposed to oxybenzone. Eight of 13 chemical sunscreen ingredients allowed in the U.S. affected calcium signaling of male sperm cells in laboratory tests, which the researchers suggest could reduce male fertility (Endocrine Society 2016). Oxybenzone is not only damaging to the human endocrine system, but it also damages the oceans coral reefs when swimmers enter the water and spread these chemicals into the delicate coral reefs. Reefs exposed to oxybenzone from sunscreen runoff are unable to reproduce because of the endocrine disrupting effects of these chemicals. Coral bleaching is another effect of UV chemical exposure, which happens when the algae in a reef die, disrupting the entire ecosystem of a healthy reef. Once those reefs die they cannot regenerate themselves. Takeaway: chemical sunscreens are proven endocrine/hormone disruptors for both humans and coral reefs with proven negative consequences. Studies seem to indicate that men are especially prone to those negative effects. Avoid all chemical-based sunscreens and those that contain methylisothiazolinone. Nano-sized minerals can also enter the cells of invertebrates living in coral reefs and cause oxidative stress which kills the reefs. Takeaway: Only buy non-aerosol (cram or stick) non-nanosized mineral sunscreens (150 nanometers or larger). All three Beautycounter sunscreen scored highest in the EWG's rating for safe suncare (1 = lowest risk.) I use the All Over Sunscreen Cream & always carry the Face Stick in my purse. I live in Florida and have to protect my skin year-round. These do not contain any chemical ingredients, leave a white residue, or make your skin look greasy, and all three contain non-nano zinc oxide that provides both UVA & UVB protection. how does your sunscreen rate for safety? Visit the EWG's sunscreen search feature by clicking the button below to see the sunscreens rated worst for safety. You can also use the search button to see how your current sunscreen rates for safe ingredients. Did you know that SPF 100 sunscreen blocks only 1% more (99%) of UVB rays than SPF 50 (98%)? When you take this into consideration you can see how SPF sunscreen in the 30-50 range gives adequate sunburn protection, even for people who burn easily.